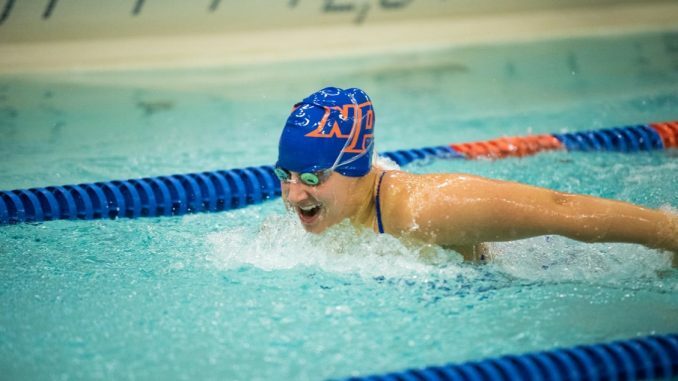 The New Paltz swim team headed to Ewing, New Jersey where they participated in the three-day College of New Jersey Invitational (TCNJ) between Nov. 30 and Dec. 2. The Hawks swam in the middle of the pack for much of the three days with the men finishing fifth out of the five participating teams the first two days and fifth out of six on the final day. The women swam to three consecutive third place finishes out of the six competing teams on day one and third out of seven on days two and three. The lady Hawks secured the lone victory on day one thanks to the 200-yard freestyle relay team consisting of fourth-year Katie Donlevy, third-year Chelsea Angulas, third-year Sarah Crespo and fourth year Nicole Lee with a time of 1:38.93. Although there were no individual victories on day one, many personal bests were set. Second-year Tessa Griger chipped eight seconds off her previous time in the 200-yard individual medley (2:22.16) while second-year Tim Stecher set career-bests in the 500-yard freestyle (5:04.23) and 50-yard freestyle (23.4) on the men’s side. Like day one, the lone victory for the Hawks on day two came on the women’s side courtesy of Angulas with a first-place finish in the 100-yard backstroke (57.92). Lee followed in third (1:00.71) while Griger finished close behind in fifth (1:02.00). The men saw little success on day two. Fourth-year Joe Galante and first-year Ethan Bonney completed the 400-yard individual relay coming in 13th and 15th with times of 4:27.72 and 4:30.66, respectively. First year Luke Gamboli was the only male Hawk to finish in the top eight on the day, finishing fourth in the 100-yard butterfly with a time of (53.77). Day three saw an improvement for the Hawks swimmers. The women secured the lone relay victory for the Hawks in the 400-yard freestyle relay (3:36.95) consisting of Donvely, Lee, Angulas and fourth-year Jaimie Kaefer. Angulas secured the only individual victory for the Hawks on the day with a first place finish in the 200-yard backstroke (2:07.33) earning her the honor of the State Univeristy of New York Athletic Conference (SUNYAC) Swimmer of the Week. Kaefer followed close behind in second with a time of 2:11.30. Donlevy added a third place finish in the 100-yard freestyle (53.99), followed by Lee (54.59) and Crespo (55.38) in fourth and sixth, respectively. On the men’s side, the highest individual finish of the day came at the hands of fourth-year Matthew Kessler who finished seventh in the 200-yard backstroke (2:04.16). The Hawks also added a fourth place finish in the 400-yard freestyle relay (3:14.49) consisting of Kessler, Galante, second-year Nolan West and first-year Jared Finn. Cumulatively, the women’s side finished with 560.5 points placing them third behind The College of New Jersey and Swarthmore College while the men finished with 323.5 points placing them fifth behind The College of New Jersey, Swarthmore College, United States Merchant Marine and Arcadia University. The Hawks will wrap up their fall semester meets with a matchup at Ramapo College on Saturday, Dec. 8 before returning to action on Friday, Jan. 11.